FACT CHECK: From a Florida ER Doctor? Are Refugees Paid More Than Retirees? 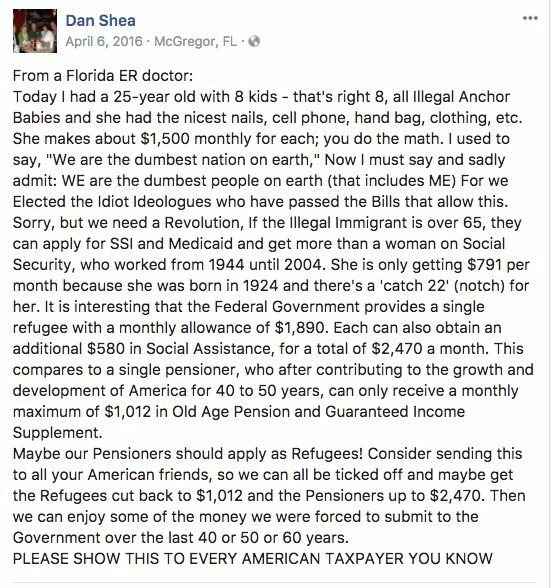 Claims that the federal government provides a much greater monthly allowance to refugees than to retirees are old and inaccurate. The federal government provides a much greater monthly allowance to refugees than to retirees. 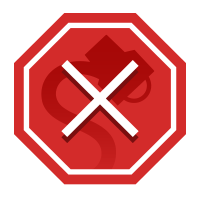 Some political issues, it seems, are so emotionally charged that proponents of one side or another will promulgate anything that reflects their viewpoint, no matter how irrelevant, inapplicable, outdated, or erroneous it might be. Pensioners should apply as refugees! Lets send this to all Americans, so we can all be ticked off and maybe we can get the refugees cut back to $1,012.00 and the pensioners to $2,470.00 and enjoy some of the money we were forced to submit to the Government over the last 40 or 50 years. Please forward to every American to expose what our elected politicians have been doing over the past 11 years — to the over-taxed American. Halfway through the 1,500-word article, unforeseen trouble was lurking. In paragraph 16, the story said single refugees are eligible for $1,890 from Ottawa as a “start-up allowance, along with a $580 monthly social assistance, depending on how soon the person is able to find employment.” In addition, they get “a night lamp, a table, a chair and a single bed from the government,” the story said. In painful hindsight, those details could have been clearer. Actually, the $1,890 “start-up allowance” — including a $580 monthly social assistance cheque from Ottawa — was a one-time payment for basic household needs such as furnishings, pots and linens. The furniture is used. In quick order, two things happened after the article ran. First, a reader sent a nasty e-mail to the reporter. Among other things, it said charity begins at home and Canada should not “roll out the welcome mat” for refugees. The e-mailer assumed — erroneously — that the refugees would collect $2,470 a month. They’d be better off than Canadian pensioners. More worrisome, the polemicist sent his rant to 100 recipients, some of whom likely spread the word to wider audiences. Ah, the wonders of the Internet! Alarmed by the e-mail, reporter Keung tried to contact the sender. It was too late. Having spread the misinformation, the e-mailer already had changed his address. At the same time, a second development occurred. The Star ran a letter to the editor that said the $2,470 “compares very well to a single pensioner who after contributing to the growth and development of Canada for 40 years can only receive a monthly maximum of $1,012 in old age pension and Guaranteed Income Supplement. “Maybe our pensioners should apply as refugees?” reasoned the writer. This compares very well to a single pensioner who, after contributing to the growth and development of Canada for 40 or 50 years, can only receive a monthly maximum of $1,012.00 in old age pension and Guaranteed Income Supplement. 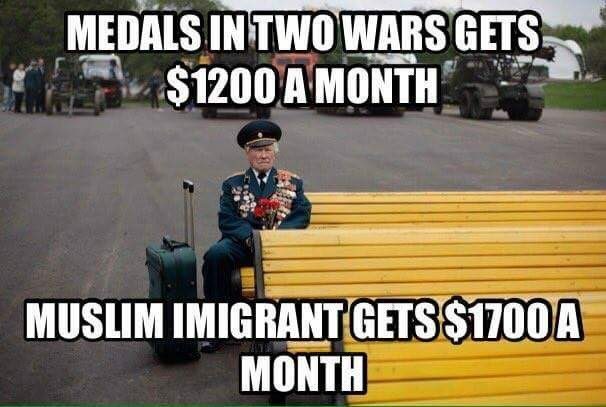 Let’s send this thought to as many Canadians as we can and maybe we can get the refugees cut back to $1,012.00 and the pensioners up to $2,470.00, so they can enjoy the money they were forced to submit to the Canadian government for those 40 to 50 years. Please forward this to every Canadian you know. Refugees don’t receive more financial assistance from the federal government than Canadian pensioners. In [a letter to the Toronto Star], a one-time, start-up payment provided to some refugees in Canada was mistaken for an ongoing, monthly payment. Unfortunately, although the newspaper published a clarification, the misleading information had already spread widely over e-mail and the internet. In truth, about three quarters of refugees receive financial assistance from the federal government, for a limited time, and at levels lower than Canadian pensioners. They are known as government-assisted refugees. We have to remember that many of these people are fleeing from unimaginable hardship, and have lived in refugee camps for several years. Others are victims of trauma or torture in their home countries. Many arrive with little more than a few personal belongings, if that. Canada has a humanitarian role to accept refugees and help them start their new lives here. For this reason, government-assisted refugees get a one-time payment of up to $1,095 from the federal government to cover essentials — basic, start-up needs like food, furniture and clothing. They also receive a temporary monthly allowance for food and shelter that is based on provincial social assistance rates. In Ontario, for example, a single refugee would receive $592 per month. This assistance is temporary — lasting only for one year or until they can find a job, whichever comes first. This short-term support for refugees is a far cry from the lifetime benefits for Canada’s seniors. The Old Age Security (OAS) program, for example, provides people who have lived in Canada for at least 10 years with a pension at age 65. The Guaranteed Income Supplement (GIS) is an additional monthly benefit for low-income pensioners. The Canada Pension Plan (CPP), or Quebec Pension Plan (QPP) for people in Quebec, pays a monthly retirement pension to people who have worked and contributed to the plan over their career. In July 2006, Canadian seniors received an average of $463.20 in OAS benefits and $472.79 in CPP retirement benefits ($388.94 in QPP). Lower income OAS recipients also qualified for an average of an additional $361.94 in GIS benefits. No. Refugees do not get more financial help from the federal government than Canadian pensioners do. A widely circulated email makes this false claim. The email mistakenly includes the one-time start-up payment as part of the monthly payment. The amount of monthly financial support that government-assisted refugees get is based on provincial social assistance rates. It is the minimum amount needed to cover only the most basic food and shelter needs. In keeping with Canada’s proud humanitarian traditions, individuals and families get immediate and essential services and support to help them become established in Canada. It’s worth noting that in Canada, much of the financial assistance is in the form of loans, which refugees have to pay back with interest. Also, as of January 2016, the alleged monthly allowances of these imaginary pensioners, no matter which country they are supposed to be living in, have not changed in more than a decade. Today I had a 25-year old with 8 kids – that’s right 8, all Illegal Anchor Babies and she had the nicest nails, cell phone, hand bag, clothing, etc. She makes about $1,500 monthly for each; you do the math. I used to say, “We are the dumbest nation on earth,” Now I must say and sadly admit: WE are the dumbest people on earth (that includes ME) For we Elected the Idiot Ideologues who have passed the Bills that allow this. Sorry, but we need a Revolution, If the Illegal Immigrant is over 65, they can apply for SSI and Medicaid and get more than a woman on Social Security, who worked from 1944 until 2004. She is only getting $791 per month because she was born in 1924 and there’s a ‘catch 22’ (notch) for her. It is interesting that the Federal Government provides a single refugee with a monthly allowance of $1,890. Each can also obtain an additional $580 in Social Assistance, for a total of $2,470 a month. This compares to a single pensioner, who after contributing to the growth and development of America for 40 to 50 years, can only receive a monthly maximum of $1,012 in Old Age Pension and Guaranteed Income Supplement. Maybe our Pensioners should apply as Refugees! Consider sending this to all your American friends, so we can all be ticked off and maybe get the Refugees cut back to $1,012 and the Pensioners up to $2,470. Then we can enjoy some of the money we were forced to submit to the Government over the last 40 or 50 or 60 years. The Toronto Star. 11 March 2004 (p. A1). The Toronto Star. 27 November 2004 (p. H6). 12 March 2004 (p. A23).